I've been drinking a teaspoon or two of apple cider vineger (ACV) in my water for a few years now. I mostly drink it during the winter months when stomach viruses are at their peak and in the spring to help with my seasonal allergies. The medical assistant at my allergists office recommended the ACV drink to me a few years ago and once I got past the tart flavor I was fine with drinking a glass or two a day. This past week when my daughters and I were visiting our public library, my oldest daughter saw this book on one of the display racks along with some other health books. She knows I drink the ACV with water and occasionally will drink it too (she is 10 years old) because she also has allergies. So I decided to borrow the book to see what more could be said about ACV. The first thing you will notice about this book is that it looks a bit 'hokey' if not old. I tried to find the copyright date in the front of the book, but could only find that this book is its fifty-fourth printing! It doesn't look like they updated any of the pictures since its first printing! I was not expecting all the advertisements for the Bragg ACV and other products they sell. I was also surprised by all the religious references throughout the book. Odd. 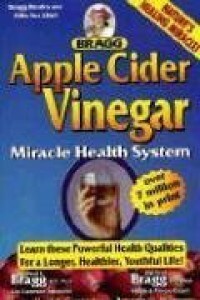 The book did talk about other uses for ACV and regular vinegar as a cleaning product. Most things I already knew. Just skip this book and look up information about ACV online.